This membership allows you to participate in our eco-volunteering missions. Membership is automatically taken into account when you register for one of our missions. You can also join the association as a Full Member, without leaving for a mission. Membership is calendar and valid until 31 December 2019. The association doesn’t have any subsidy or state aid, so it retains full freedom of action. 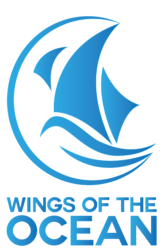 To join Wings of the Ocean is above all to share our convictions. Your membership as a support member contributes to the financing of our clean-up missions.